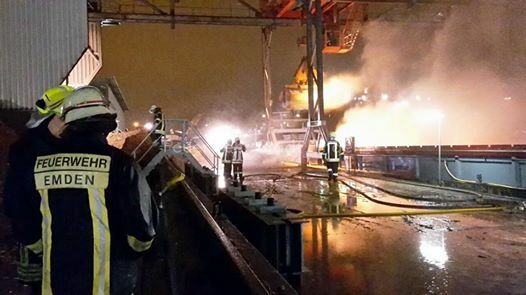 The 110 meter long self-propelled barge Lorena suffered a fire on the Ems River while berthed at Emden, Germany. The Lorena was moored at the power plant when a fire started in the cargo hold containing 1000 tons of wood pellets. The crew requested assistance from the local fire brigade. A crane was used to remove some of the cargo and place it on the pier where fire fighters doused it with water. For several hours, the fire fighting efforts kept the cargo wet until the smoldering fire could be extinguished. No reports of injuries. Reports state the crew later pumped the water out of the hold the following day. The 39 meter long, 255 ton fishing vessel Jinhai 805 ran aground off the Oki Islands, Japan. The Jinhai 805 was attempting to take refuge from bad weather when the vessel ran up onto the rocks near Shimane. The Jinhai 805 sent out a distress call with the Japan Coast Guard responding. Authorities rescued 23 of the 25 crew from the fishing vessel. Two men were reported as missing. Four of the rescued crew were later taken to hospital for treatment for hypothermia.